It wasn’t raining when I started walking early in the morning, but I knew the rains would come. I went across the street to the Palace and started walking around the grounds in an area that was new to me. It’s so large I’ll never see all of it. 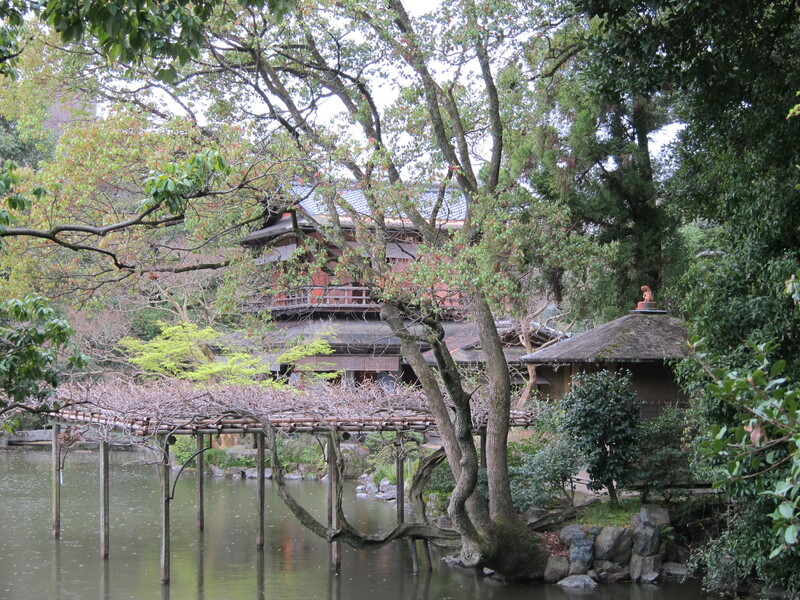 I found two shrines with lovely gardens. I intended to return to the inner garden of the palace after about 10 am, hoping the rains would keep people away. 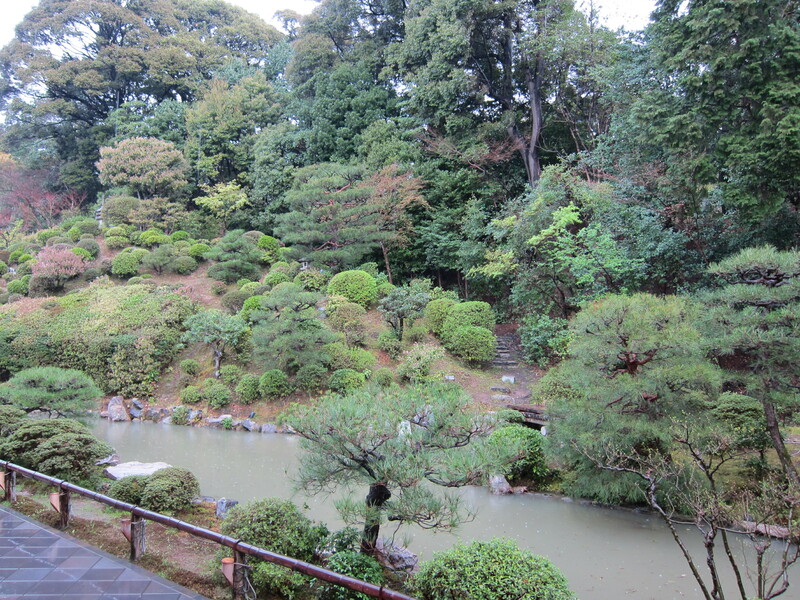 But the rain became serious before the time arrived so I boarded a bus and headed for the Kyoto National Museum. 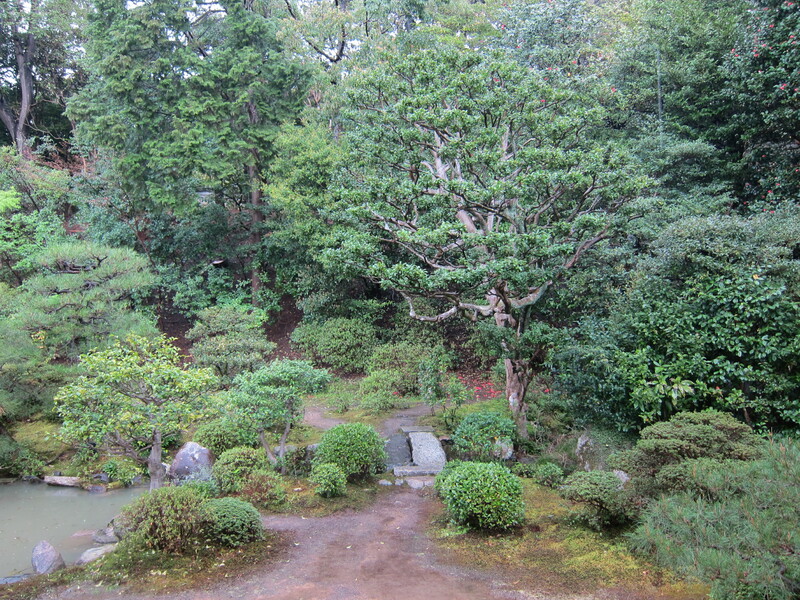 The first thing I saw when I left the bus was a sign for Chisakuin, a temple with one of my favorite gardens. 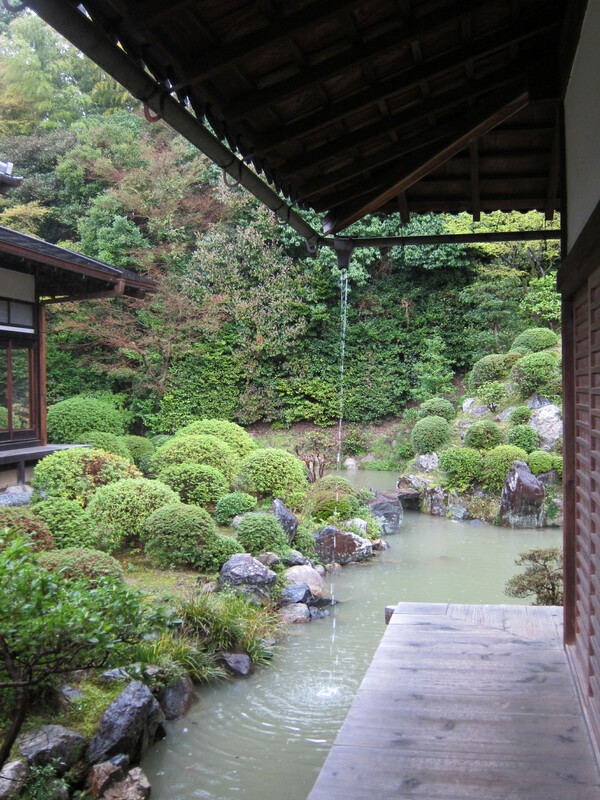 This is a garden you must view from the temple buildings; you do not walk into it, making it a perfect garden for viewing in the rain. My intention had been to return in sunshine, since I had seen it in rain previously, but never pass up an opportunity. Again, because of the rain very few people were around. I stayed as long as my legs would allow then finally went to the museum where I saw an interesting exhibit of the work of two 17th century artists who bridged the transition from Kyoto as the capital, presided over by the emperor, and Edo (Tokyo) becoming the capital presided over by the Tokugawa shogunate. I enjoyed the exhibit almost as much as I enjoy the gardens, but not quite. I think more when I’m looking at art, whereas the gardens just seem to enter into me. Finally I went on my daily quest (foraging) for dinner. Most of the prepared food places seem to carry the same things: fried stuff, as in tempura, fried stuff as in heavily breaded chicken or mystery cutlets, sushi, a small number of salads that look alike at each place and a few other things. However, I found that quality differs considerably. I won’t go back to Fresco, which is too bad; they are conveniently located. But I threw out at least half of what I bought because I could taste the can. I found a little place on the street near the bus stop that has much better quality but more limited choices. Oh well, I didn’t come here to eat. 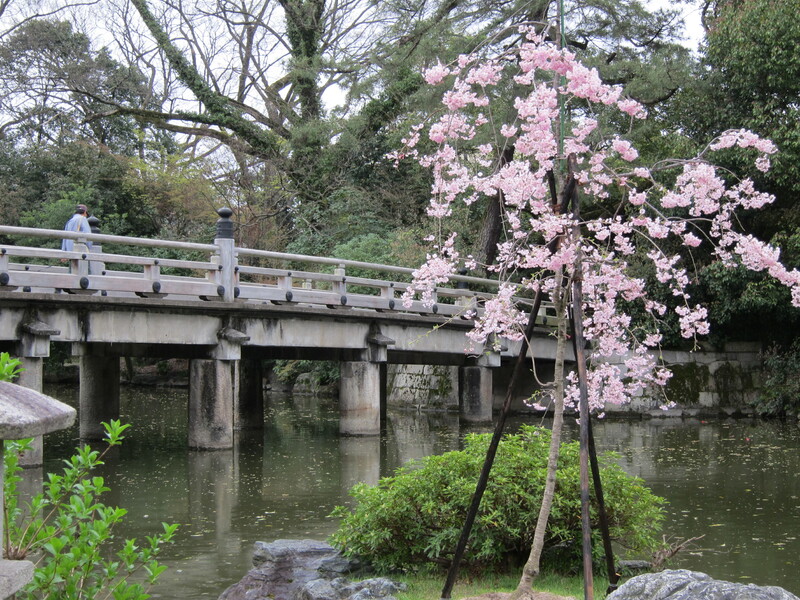 This entry was posted in Art, Garden, Japanese Gardens, Photography, Walking by ruthek. Bookmark the permalink. It may have been raining alright, but you got some beautiful shots there. Funny how more brilliant the colors are. It’s almost as though I would feel the splashes if I hold out my hand to the shot of the rain pouring from the downspout, and shiver as well. As for the food, well, if you begin to yearn for McDonald’s, then I will start to worry about you!